My photo shoot this week was almost a carbon copy of last week's. 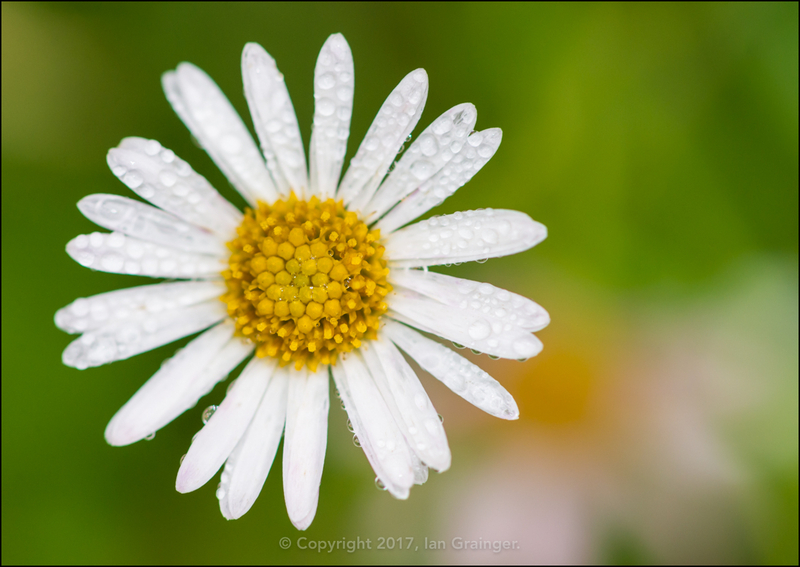 It was wet, it was warm, and I only had a short period of time to capture some interesting or colourful imagery before I was soaked to the skin. 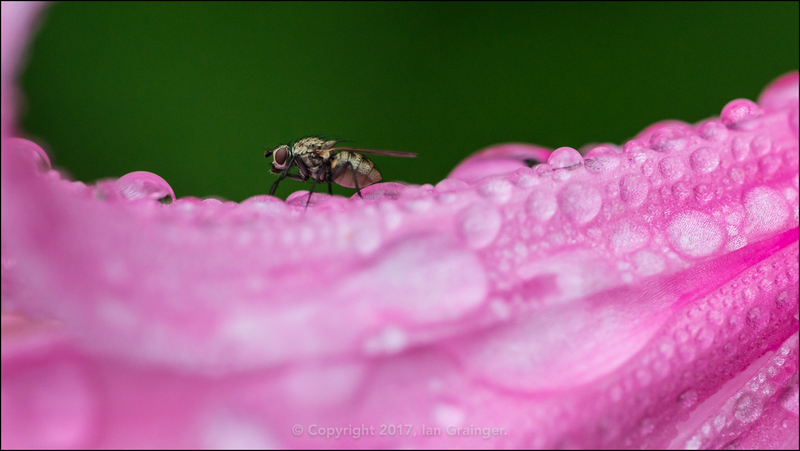 The big difference this week was that there were some insects braving the rainfall along with me. 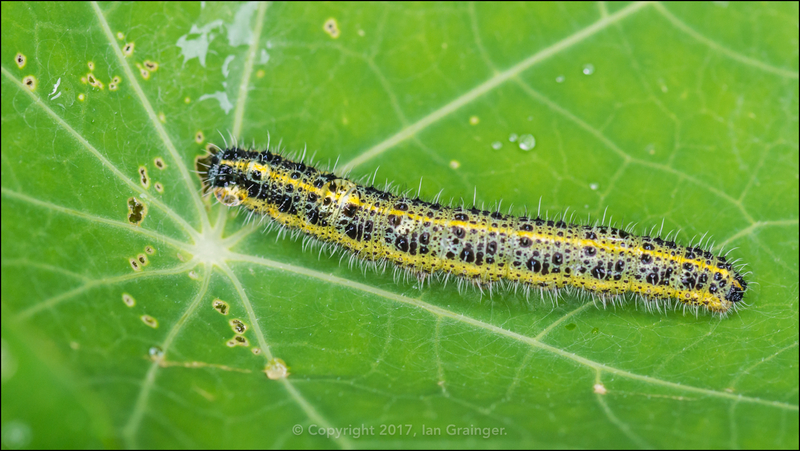 This Large White Butterfly (Pieris brassicae) Caterpillar was enjoying devouring some of the remaining few Nasturtium (Tropaeolum) blooms. 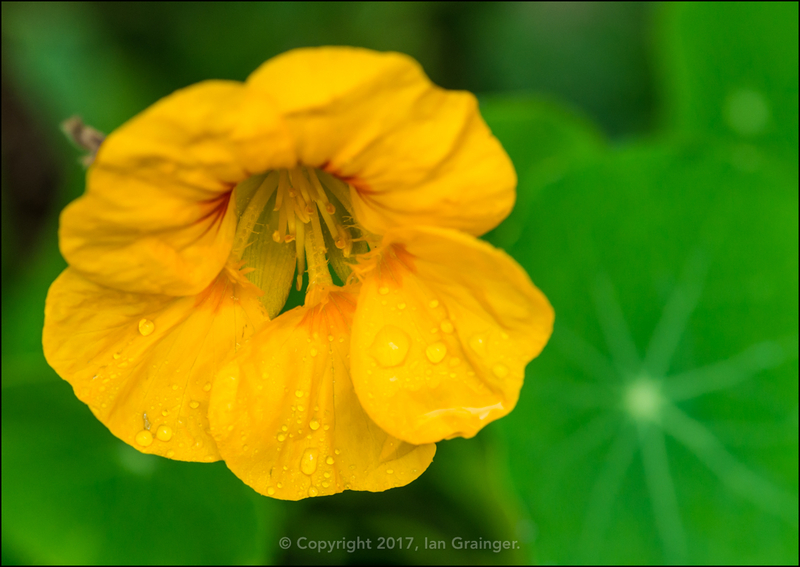 While this one, and probably up to a dozen more, were doing a good job of decimating the Nasturtium leaves. 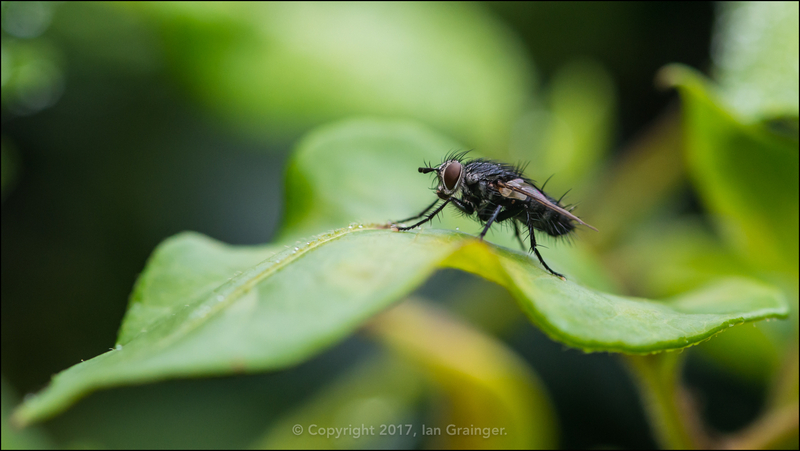 Other than the Caterpillars, there seemed to be an abundance of Flies (Diptera) around. They were sheltering in every nook and cranny, although this one seemed to be surfing a leaf in the rain. 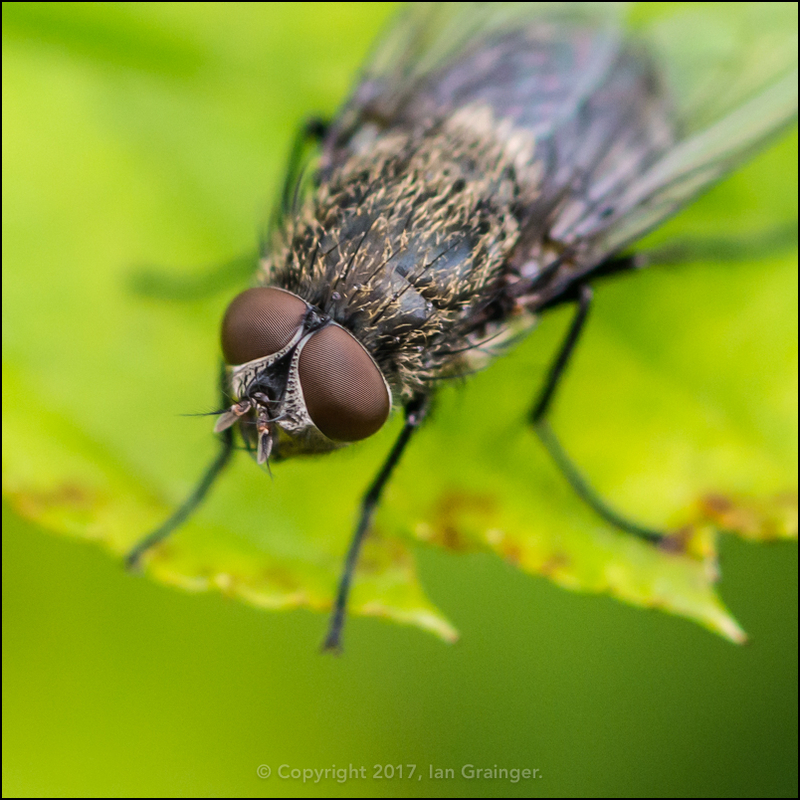 What caught my eye about this fly were the golden hairs on his back. 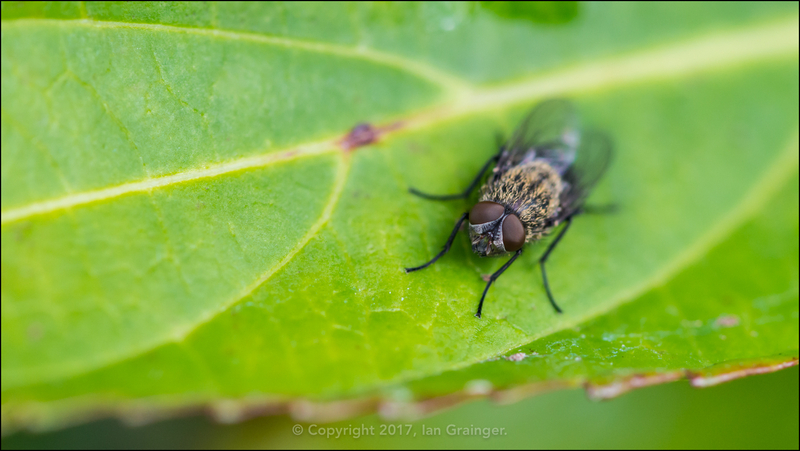 I'm not one hundred percent sure, but I think it's a Cluster Fly (Pollenia rudis), which are just getting ready to hibernate indoors at this time of year. Here's a closer view to help you determine whether or not you'd like one (or more likely thousands of them) as a house guest! 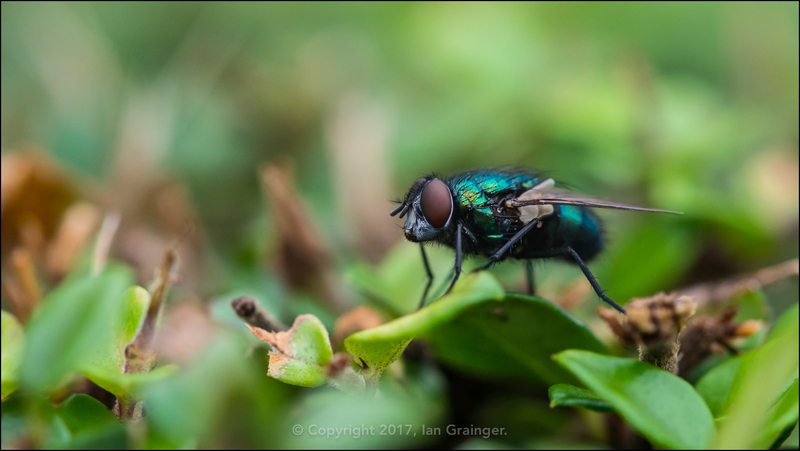 There were plenty of Greenbottles (Lucilia caesar) buzzing about in between the short showers. 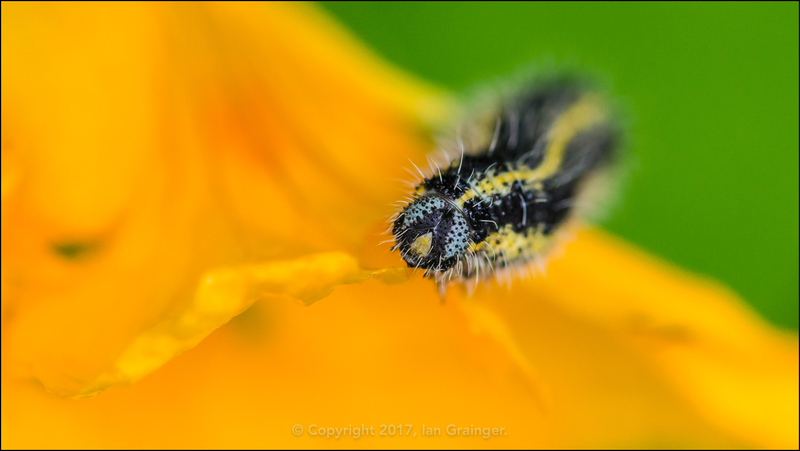 This one was taking refuge in a Viburnum hedge. 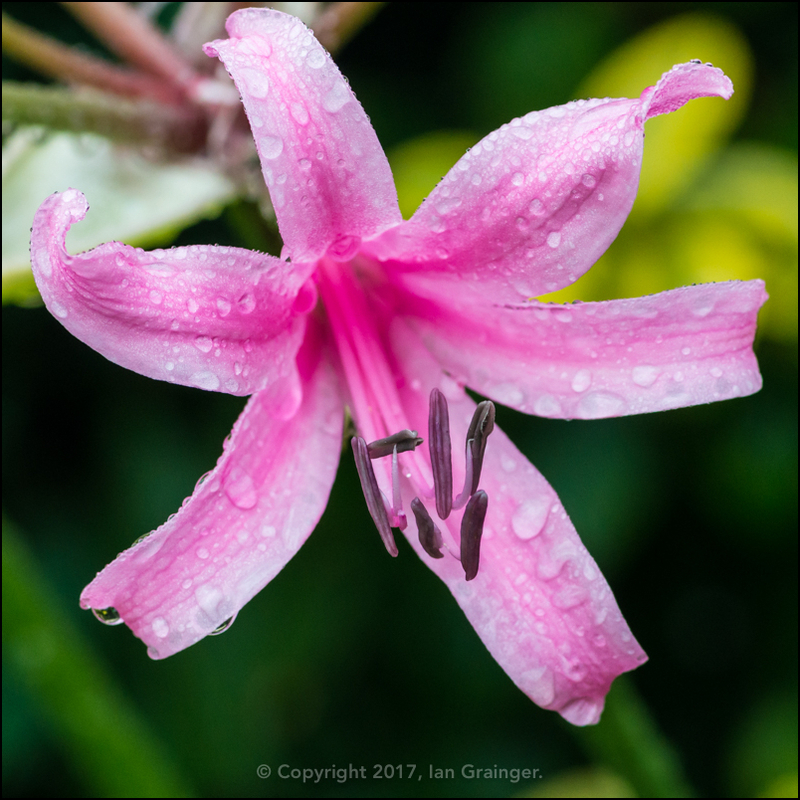 This little guy had been grounded on a Guernsey Lily (Nerine bowdenii), but was making up for the inconvenience by collecting water from the droplets on the petals. 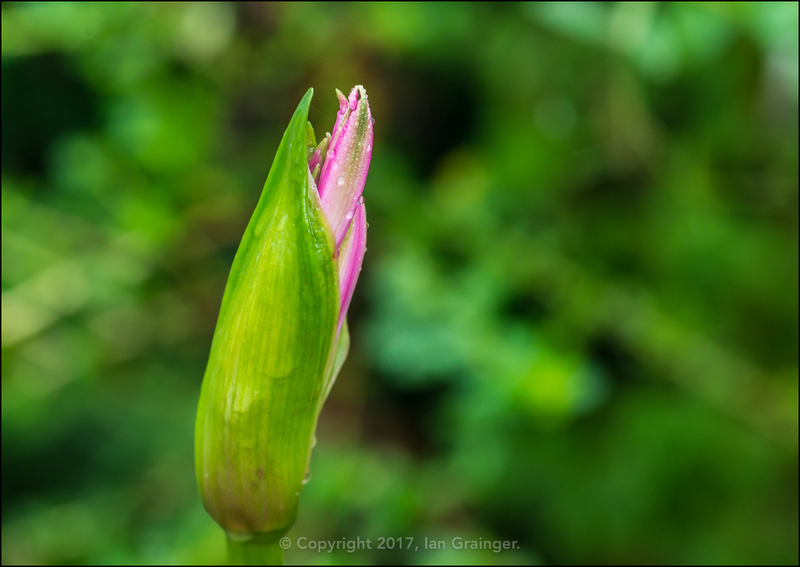 The Nerines were actually looking magnificent, despite being in flower a full two months earlier than they ever had been before. We were also in for a treat, as both varieties that had been planted had produced flower stems this year. With over half a dozen bulbs getting to the flowering stage, this was some sort of record for us! 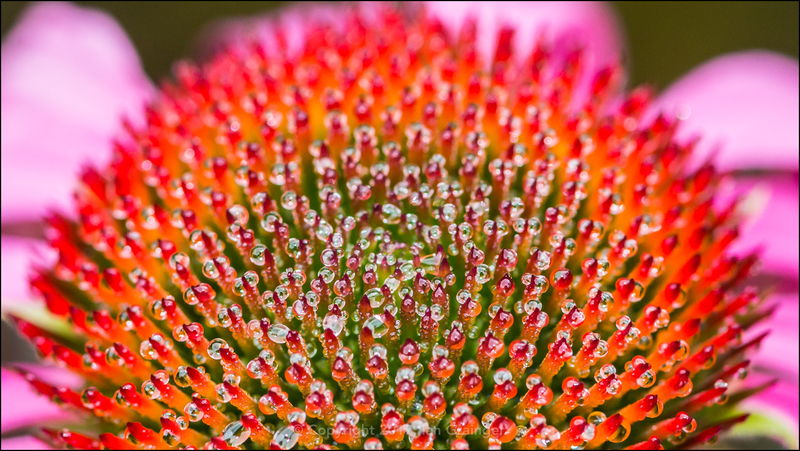 The Coneflowers (Echinacea) were still going strong, and I loved the way their spiky centres held on to the tiny raindrops. 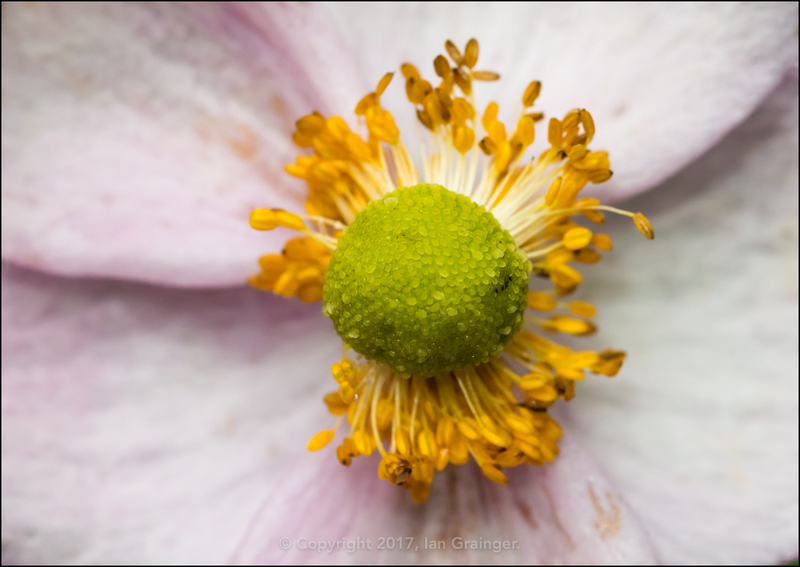 The Japanese Anemones (Anemone hupehensis) were doing a good job of lighting up a dark corner. I particularly like this variety, with its bright green golf ball like centre, with golden surround. 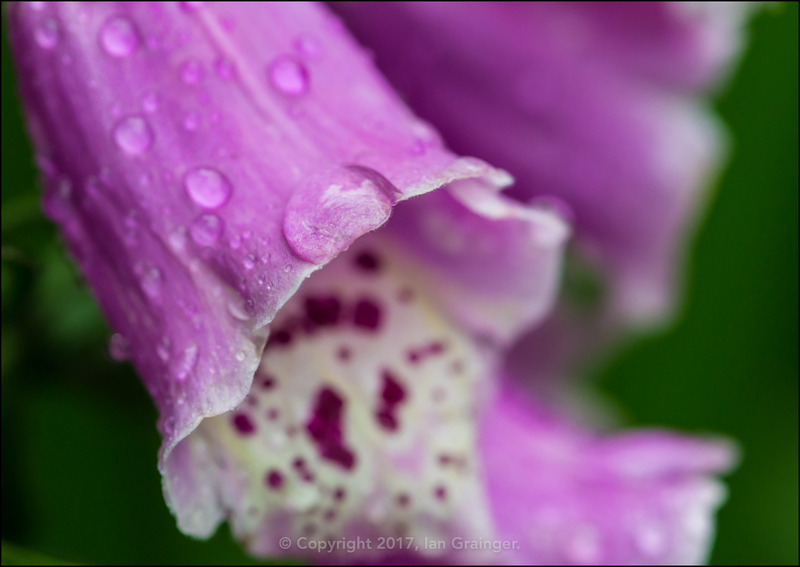 I was very surprised to see these Foxgloves (Digitalis) in bloom at this time of year. 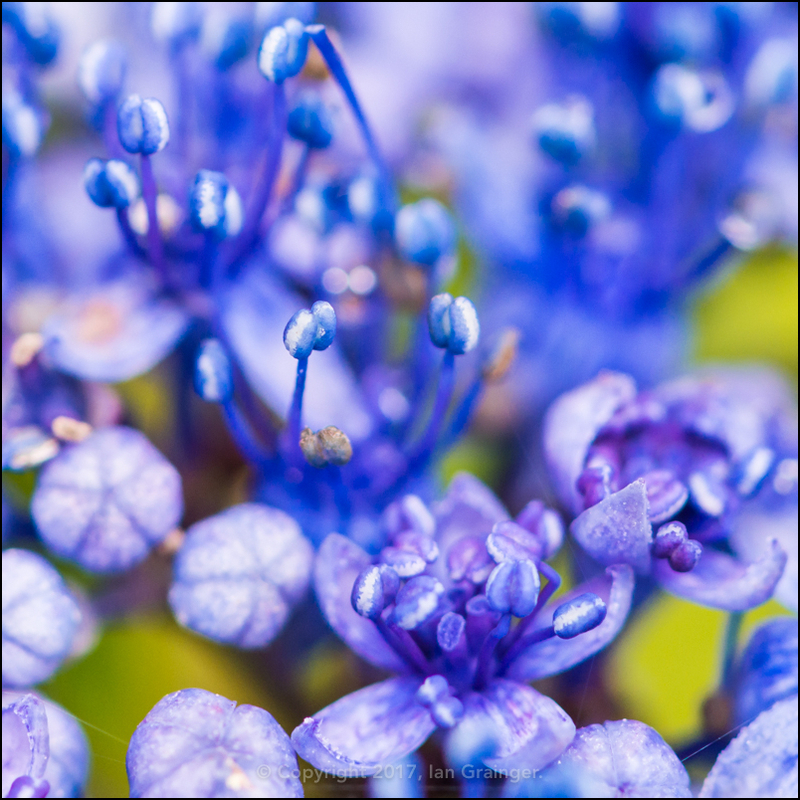 I wasn't expecting them to show up until next year, but they were a welcome addition to the garden. 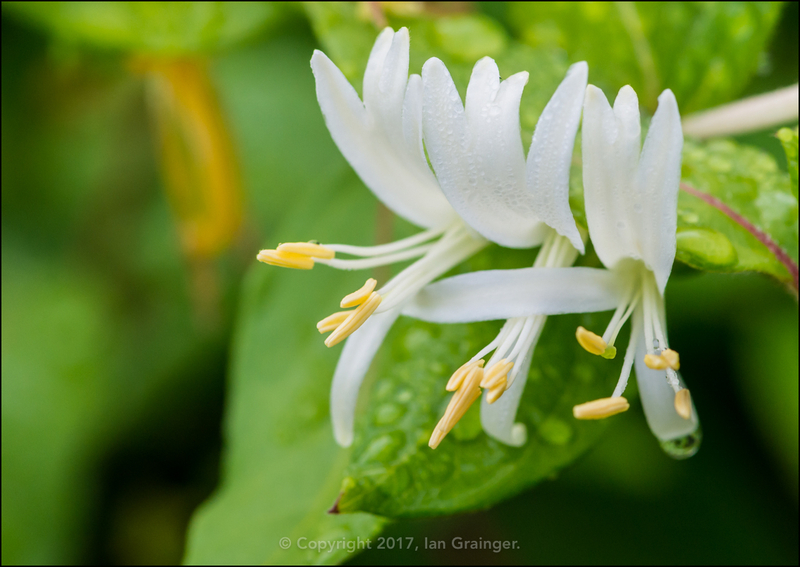 The Winter Honeysuckle (Lonicera fragrantissima) was flowering yet again. 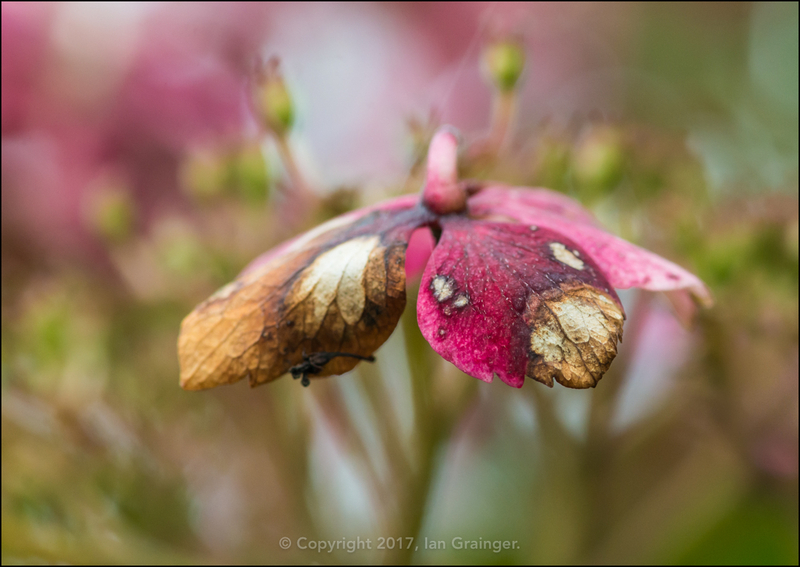 I'm not sure why this variety has been given a seasonal name, as I'm pretty sure it's been flowering in one part of the garden or another all year long. ...unlike these Erigeron 'Stallone' blooms that were simply dying back now. ...while other examples had definitely given up the ghost. 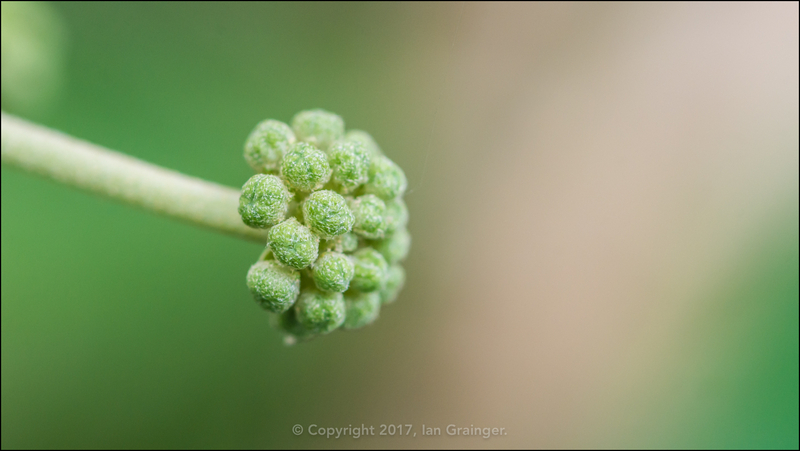 It wouldn't be long now before the Common Ivy (Hedera helix) was showing it's small explosions of flower buds, with the berries following on soon after. 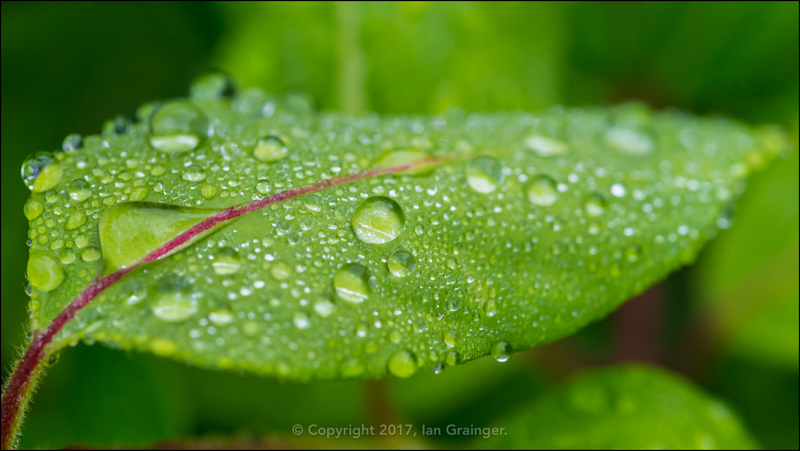 I couldn't resist taking a photograph of these raindrops all resting on a leaf. It's a shot that really sums up the last two weeks worth of photographs - being wet. Finally, I'm still persevering at capturing half decent images of my fishy friends. 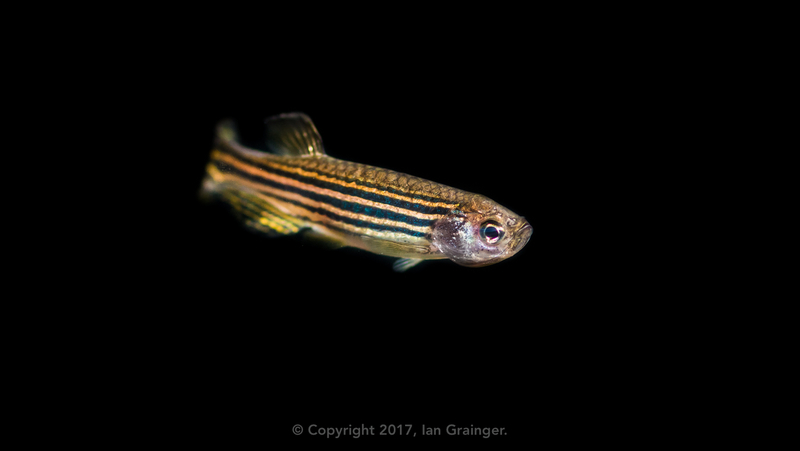 This week I thought I'd have a go at capturing my Zebra Danios (Danio rerio) again. I figured that because I had three in a quarantine tank, that contained nothing but the fish, gravel, heater and filter, that they'd be easier to get a good shot of. Alas, it was still a very frustrating experience. However, I did manage a couple of half decent shots, this one being the best of them.